A stark statement about war delivered through deftly designed stealth survival and resource management. Important, but unrelentingly cruel. What it is: A gruelling survival game that is part life-sim and part 2D stealth action. I'm watching the final moments of a woman who has lost the will to live. Katya returned from studying abroad to a war-torn country where people scavenge to stay alive. She wasn't always alone, but a few days ago Anton, formerly a teacher, died of starvation. Before him Pavel, once a star footballer, was wounded when roving bandits besieged them. Without bandages he bled out. Cveta, mother figure of the group, became sick and Katya went out in search of medicine. A nearby house had the medicine she needed, but it was home to an elderly couple. Brandishing a knife she hobbled to their bathroom as the old man desperately pleaded not take his sick wife's medicine. Katya wasn't a bad person, she was desperate. But it was too late, Cveta died. Depressed and starved she crumbled to her knees. I frantically clicked the tinned food icon hoping she'd eat to regain some strength, but she ignored my commands. I imagine she was coming to terms with the futility of it all. As I quit out, not wanting to see her prolonged, gruelling demise, I certainly was. 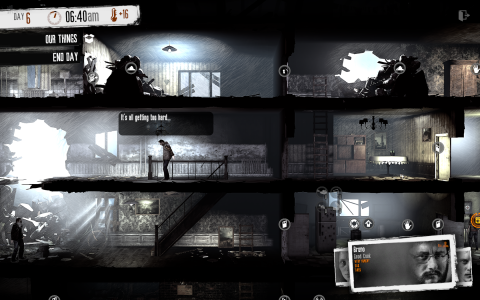 This War of Mine explores the harrowing realities of living amid war. This War of Mine explores the harrowing realities of living amid war. Its resource management, life-sim and exploration mechanics are simple but elegantly drive home a message: in modern war you will die like a dog for no good reason. Each day plays out in two phases. In the light snipers confine characters to a musty multi-storey building, displayed through a side-on cross-section and rendered with a hand-drawn crosshatch visual style. Like a grim version of The Sims, players click around to move characters and on icons to assign tasks such as making food, building, clearing rubble, rifling through resource points or administering aid—either medicinal or moral. All of this is reliant on having the appropriate resources, which are gathered at night when a character can be sent to scavenge while the others sleep or stand guard. Locations include abandoned squallers, schools, hospitals, churches and more. Areas with more valuable resources are either inhabited or defended, while the safer places yield less. In the scavenging phase inspiration has been taken from Mark of the Ninja. Everything outside line of sight is enveloped in a fog, giving the exploration real tension. Walking is silent but slow, while running comes at the risk of making noise, denoted by emanating circles of sound. Enemies emit these same tells, as do rats scurrying around. NPCs that hear the sounds or spot you in their line of sight will investigate, The defenseless cower, some propose a barter, others respond with deadly force. The slow, deliberate pacing accentuates the languishing, oppressive atmosphere. Your characters are fragile and ranged weapons difficult to come by, so you never quite feel safe. Whether you're pillaging an abandoned house or risking life and limb in a heavily fortified hotel there's a feeling that it could all go wrong in the blink of an eye. It's almost overbearing. The feeling of desperation is ever-present, you'll never quite have enough food to satiate everyone or the building materials to thrive. Each day is a suffocating struggle. The morality and bartering systems do not bend to accommodate your worsening conditions. When the trader comes knocking, he doesn't care that you're on the verge of death, your acrid tobacco is worthless to him. When desperate children plead for food, turning them away always negatively impact the mental state of characters, making them sad, depressed and even suicidal. It's common to return from scavenging to find a character has hung him or herself. When approaching inhabited areas you can't initiate a trade yourself. You'll want to cry out that you just need a little bit of food, but either the NPC will offer a deal first or you're an invader. Good deeds can pay off in the future, but it usually feels like too little and is often too late. Goals like developing a rain filtration system or making moonshine feel like unachievable feats. Instead you have to make do with cobbling together an armchair, finding a book, trading for coffee or stealing a cigarette to raise morale. It quickly becomes a grind; visiting the same locations over and over, expending resources to survive the present instead of building for the future. This War of Mine is one the most thematically interesting games of the year, but it's also a very difficult to play. Its world always has its boot to your throat, slowly increasing the pressure until the inevitable moment where the life is drained from you. There is no happy ending, and that's the point.